This page describes a basic instrument able to produce permanent magnets: the Radio Frequency Laboratories Inc., of Boonton, New Jersey, Model 107 magnetizer. This equipment was probably manufactured around 1960, or perhaps earlier. A modern version would differ in detail but not necessarily in the basic principles. 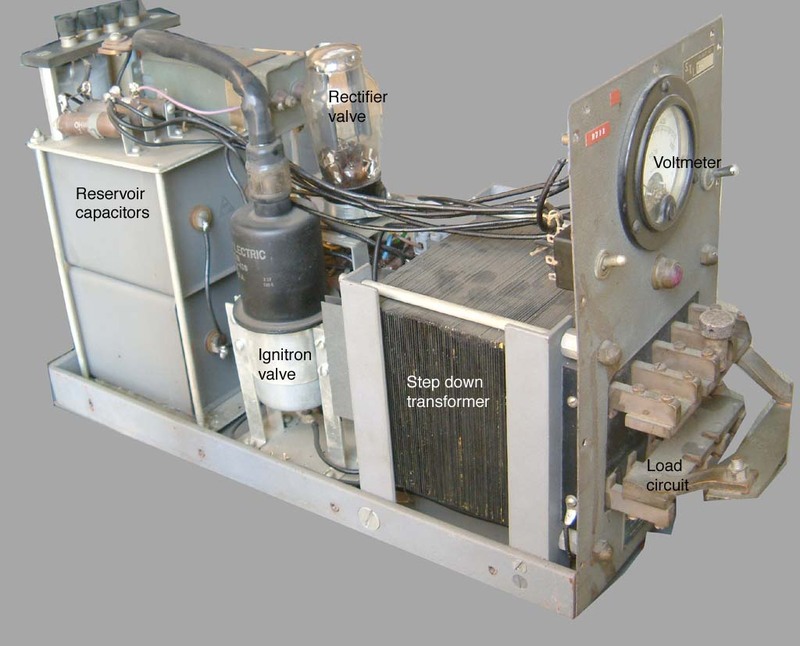 A small mains transformer (located beneath the Brimar 5U4G rectifier valve) generates around 600 volts after full wave rectification and smoothing by the large bank of reservoir capacitors at the back. Across this supply is connected an ignitron valve (GL-5550 / GL-415 Size A) in series with the primary of the step down output transformer. The secondary of the output transformer consists of five single turns of heavy guage wire connected in parallel. The core of this transformer measures about 145 mm wide by 120 mm high by 125 mm deep. The entire unit weighs 75 pounds; most of which is accounted for by the transformer. After the reservoir has charged up the switch can then be pressed to trigger the ignitron. The full 600 V reservoir supply is applied across the primary. Many thousands of amperes then circulate round the secondary (provided the bolts attaching the load bar have been tightened properly). Last modified: 2007 April 10th.